I always look forward to photographing Charlie, Owen, and Carolynne. 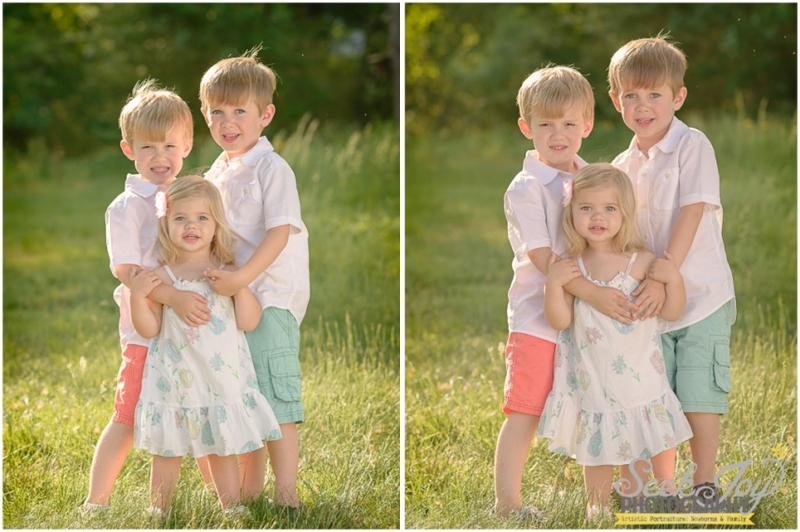 This family is dear to my heart as I have been their family photographer since the twins turned 2. The boys are now five and Carolynne just turned 2. We met up at one of my favorite secret locations and the lighting was absolutely gorgeous that particular evening. I loved the variety of wild flowers blooming in this particular field surrounded by large trees and small walking paths. I also loved the outfits the children wore that matched the location wonderfully. (Tip: Make sure your children’s attire coordinates with the location of the session). 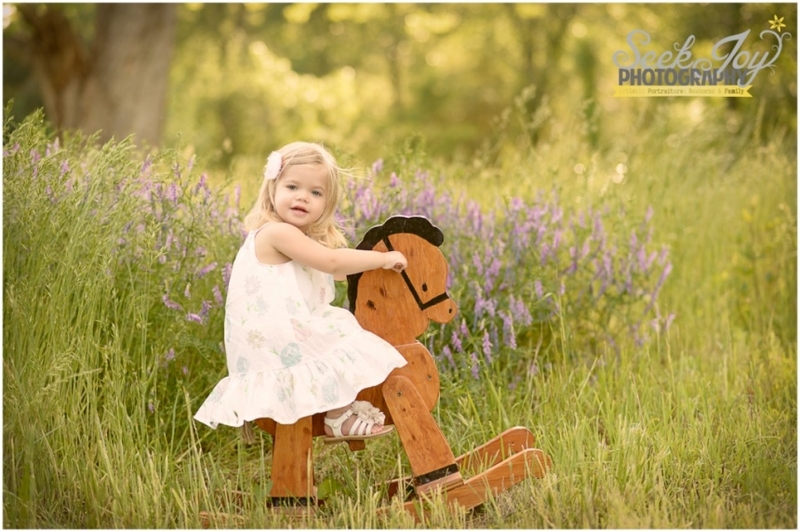 I photographed the twins on their 2nd birthday using the same rocking horse prop you see here with Carolynne for her two year portraits–how sweet is she! Carolynne can be quite shy, but this session, she really opened up in front of the camera. Their mom has learned the kids give me the best expressions when she stays a few feet away and watches from afar–this is a tip I often tell parents when I am photographing children ages 2+. I always try to make my sessions with kids fun and interactive and brought along several props that would engage the children in play (be sure to check out the images of the three of them reading as well as playing with a vintage video camera). 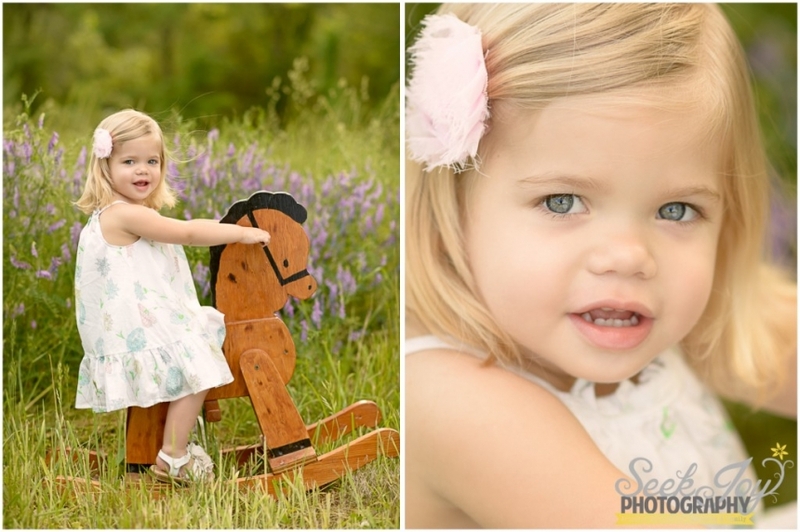 If you are interested in child portraits this fall, be sure to contact Katie at katie@seekjoyphotography.com to learn more! Your pictures continue to amaze me, Katie. Of course, these are my very favorite subjects! So happy that you’re “part of the family”!